It is an unfortunate fact that everyday activities can quickly stain our teeth, leaving them looking yellow and dull. There are many OTC products that claim to remove this discoloration, but they often fall far short of expectations. Instead of throwing away time and money on whitening methods that do not work, we invite you to contact us to learn more about how your dentist in Bristol can help you achieve a Hollywood-ready smile. We always recommend that our patients get a regular teeth cleaning before their Zoom! teeth whitening procedure. Once your teeth are clean, we prepare your mouth. We cover your lips and gums so the bleaching gel doesn’t irritate them. We apply the Zoom! hydrogen peroxide bleaching gel to your teeth and then use a special light to activate it. You get to relax during the three 15-minute sessions of light activation. We apply a sensitivity-reducing gel to your teeth. You walk away feeling like a brand new you! Zoom! is an amazing treatment, but it isn’t right for everyone. If your teeth are extra sensitive, or you think it may be uncomfortable to sit through an in-office whitening procedure, you may want to ask your cosmetic dentist in Bristol for a take-home whitening kit instead. 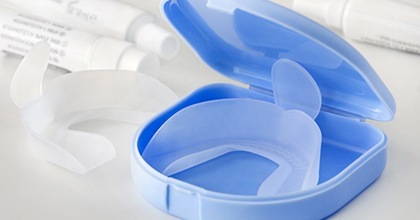 Using custom trays, you apply bleaching gel to your teeth every day for two weeks. During that time, your teeth could become up to eight shades brighter! Take-home kits are also fantastic for people who have undergone in-office whitening. After all, you can’t expect your teeth to stay pristinely bright without performing occasional touch-ups. 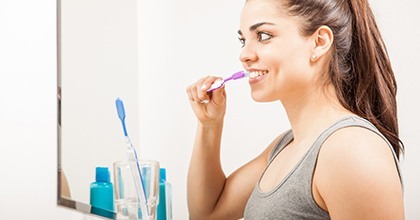 In addition to performing touch-ups on your teeth once in a while, we always suggest that our patients take steps in their everyday lives to prevent new stains from dimming down their smile. Drink dark beverages, like coffee and red wine, in moderation. Enjoying them through a straw can minimize the amount of contact they have with your teeth. Use a whitening toothpaste to battle surface stains. Visit the dentist twice a year for a professional cleaning. Who Is a Candidate for Professional Whitening? Professional teeth whitening in Bristol is ideal for almost anyone who wants to have a truly head-turning set of chompers. However, if you have significant oral health problems, such as gum disease, we recommend that you get these taken care of before you focus on your smile’s aesthetics. 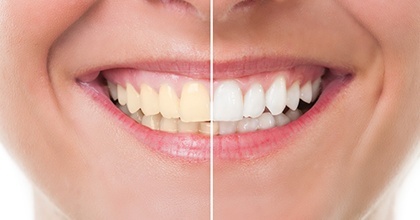 It’s also worth noting that if you have dental bonding, veneers, or tooth-colored fillings at the front of your mouth, whitening may not be right for you simply because the bleaching gel will not affect these restorations. You may need to talk to your dentist about other treatments that can give you the grin of your dreams.